Nikol Szymul staffs a reception desk at Amazon offices in downtown Seattle. Online retail powerhouse Amazon is searching for a second headquarters location, which an official from Toronto has called "the Olympics of the corporate world." Which communities are vying for the HQ2? 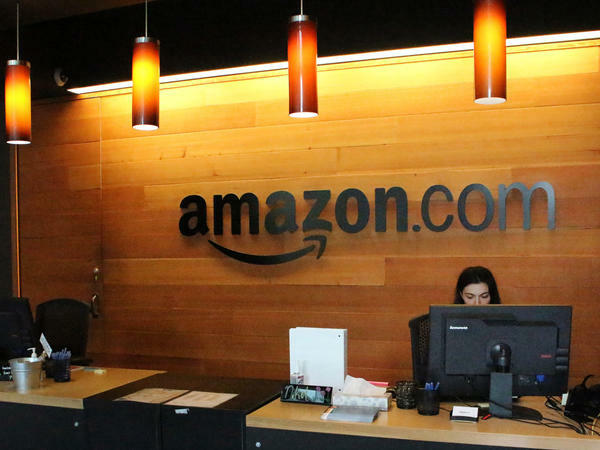 Amazon wants to find a home for a second headquarters. The Seattle-born company put out the word about two weeks ago and has set a deadline of mid-October. We'll find out who's in the running on this week's All Tech Considered. CHANG: And our guide to the bidding cities is NPR business reporter Alina Selyukh. Hey, Alina. CHANG: OK, so before we jump into the competition, remind us what is at stake here. SELYUKH: What you've got one of the world's wealthiest companies essentially soliciting bids for a new corporate location super publicly. SELYUKH: We're talking about a company that employs more than 341,000 people in the U.S. And it's promising to invest $5 billion in whatever community it picks and to bring up to 50,000 new jobs. And we're talking on average pay of six figures. CHANG: Fifty thousand new jobs. I can imagine that a lot of the local communities vying for their cities are not being at all shy about touting their assets right now. SELYUKH: Certainly no shortage of pitches. Here's a small sampling. YURIY GORLOV: Amazon should locate its second headquarters in Aurora, Colo., because Colorado is perfectly aligned with the company's culture. RONNIE BRYANT: The Charlotte Regional Partnership. We are the fastest-growing community for millennials in the country. SCOTT LEVITAN: North Carolina is a state that has worked very hard to create a friendly environment for business. A J ROBINSON: Downtown Atlanta. We have a lot to offer in terms of our talent base. And most of all, people like to live and work here. COMPUTER-GENERATED VOICE: Obviously, Washington, D.C.
MURIEL BOWSER: They have the West Coast Washington and the East Coast Washington. SELYUKH: The folks you just heard from are Yuriy Gorlov of the Aurora Colorado Economic Development Council, Ronnie Bryant of the Charlotte Regional Partnership, Scott Levitan of North Carolina's Research Triangle Foundation, A.J. Robinson of Central Atlanta Progress and Washington, D.C., Mayor Muriel Bowser. CHANG: ...Of a very, very long list of cities that are vying for this, right? CHANG: What is Amazon asking for from these cities? What does it take to make a bid? SELYUKH: They've issued essentially a call for bids that's super detailed. A major factor is the size of the community. They're looking for a metro area with more than 1 million people, a business-friendly tax structure, something close to an international airport and right near major highways, a place with mass transit and coverage by multiple cell phone carriers - a fine point - but also a place that would support a diverse population and has, quote, "excellent higher education." CHANG: Does it feel like every major city wants an Amazon headquarters at this point? SELYUKH: I mean, we heard from some. Others in the running are New York, Boston, Chicago, D.C./Baltimore, Ottawa and Toronto up in Canada. One official there actually called this the Olympics of the corporate world. CHANG: The Olympics. Well, I guess I can see the Olympics parallel. But this also feels a little bit different from the Olympics. SELYUKH: Definitely. I mean, the biggest difference is that the Olympics come and go while the Amazon skyscrapers and thousands of office workers are here to stay. But I did ask A.J. Robinson of Central Atlanta Progress about the lessons his city learned from hosting the Olympics. ROBINSON: Having survived the Olympics and grown exponentially since the Olympics, we know that post winning you have to deliver. SELYUKH: And what he specifically named was infrastructure, transportation and housing, as in it's one thing to attract thousands of new workers, and it's a whole other thing to make sure that they actually fit in your city. CHANG: That's something we've heard about in Seattle. You know, Amazon's been blamed there for the rising housing prices, traffic congestion, gentrification - a whole host of problems. So do you get the sense that there are some applicants that are concerned about the potential downsides of this? SELYUKH: We talked to economic development folks from different communities, and I asked them specifically about this. Has anyone in your group raised their hand and said, maybe this isn't such a great idea for us? And not one person admitted to that. Here's Yuriy Gorlov from the Denver area in Aurora, Colo.
GORLOV: There's no downside to this. Headquarters always boost the economy. In general, they attract a lot of good people. They only drive the economy forward. And that's what we're all about. SELYUKH: Of course, I don't think communities are being naive about what happens when - to a city when it gets flooded with high-net-worth office workers. But for right now we're in a competition, so it's not a great conversation starter. CHANG: But are you seeing some pushback in communities from people who really do not want an Amazon to be there? SELYUKH: Mostly newspaper opinion sections. For example, Denver came out as the winner in an analysis by The New York Times recently in part because it has a high quality of life, a growing labor pool. But of course, a huge consideration is financial incentives. Part of the competition is who can offer Amazon the most appealing tax break or fee reduction? And so The Denver Post has now come out with an editorial warning against a huge cost to taxpayers. They write, we'd love to see Amazon located here as long as we're not left feeling like we've given away the store. CHANG: All right, that's NPR's Alina Selyukh. Thank you.